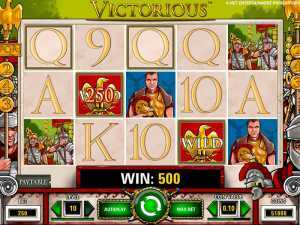 Victorious slot machine is one of the more simplistic slot machines from NetEnt. While the imagery is good enough, the animation is sparse. When the game loads, ir just starts the game with no intro or any type of rule. This is rather a simple break from the other free spins slot. However, this game plays as well as the other games that NetEnt has released. Victorious slot machine has 5 reels and 10 paylines which give you multiple ways to win. There are also bonus features that come with the game that are activated with certain symbols in order for you to bring in the bigger winnings. Among the symbols of the Victorious slot game are the poker signs, Caesar, the eagle, and the golden wreaths. When you get three golden wreaths in a payline you trigger 15 free spins. This is where you can win plenty of money. The free spins continue on automatically until they run out. When the free spins are triggered, it shows a image of a soldier with the words free spins. Another good thing about this game is that you have control over when the reels stop spinning. You don't have to wait for the reels to stop all on their own. The game barely has any animation other than the eagle which is the wild symbol. When the wild symbol completes a combo, then the eagle spins. That is as much animation in the game as you are going to see. However, the real sign of a high quality slot game is that it works smoothly without any problems. Fortunately, the game is very responsive and you can easily win a good combination and activate some good features. It just requires a lot of skill and being able to keep up with the symbols as they are spinning. Here is the Aliens video slot machine by NetEnt! February 26, 2015, No Comments on Here is the Aliens video slot machine by NetEnt!